We can’t always monitor every sector of our home, especially if the home is pretty large. This can be worrisome. There is a risk of some criminals breaking in and robbing you. Or maybe you are just worried that a wild animal can get in without you knowing, if your house has a rather open design. Whichever the reason is, it is always a wise idea to install a security camera that can monitor your whole home. That way, you will be able to catch an intruder, either a man or an animal. Some people are too lazy to place a security camera because of the complex installation. However, this should no longer be a valid argument with Lorex LW2110. Lorex LW2110 is a wireless security camera. It actually consists of two parts, the camera and the receiver. The camera can be mounted anywhere, indoor or outdoor, but still requires a power outlet nonetheless. Meanwhile, the receiver needs to be connected to a DVR, monitor, or TV. The camera streams the signal wirelessly to the receiver, which then allows the streaming to be recorded or displayed real-time. Since the streaming is wireless, Lorex LW2110 eliminates the need of a lengthy cable, allowing for a simpler and easier installation. You can use multiple Lorex LW2110 systems on a single DVR, monitor, or TV to create a multi-channel security system. As we mentioned above, Lorex LW2110 can work for outdoor purposes too. The camera comes with the IP66 rating, which means that it is waterproof and weatherproof. It can work in all weather conditions. The camera has also been equipped with infrared lights for visible images at night. It can record in 640 x 480 or 320 x 240 resolution. Well, the image quality is not the sharpest, but still usable. Besides, the color quality is highly accurate and realistic. The maximum unobstructed range between the camera and the receiver is 450ft for outdoor, 150ft for indoor. However, you should put the receiver closer to the camera if there are obstacles blocking the path, such as walls and furniture. Unfortunately, the connection is not highly reliable. Even in a clear direct line of sight, the signal still drops occasionally. In addition, Lorex LW2110 does not have a built-in remote access feature. If connected to a smart TV or smart device, you probably can set a remote access so that you can see the recording through your smartphone – but the setup is rather time-consuming, and there are other wireless surveillance cameras that come with built-in remote access features already. 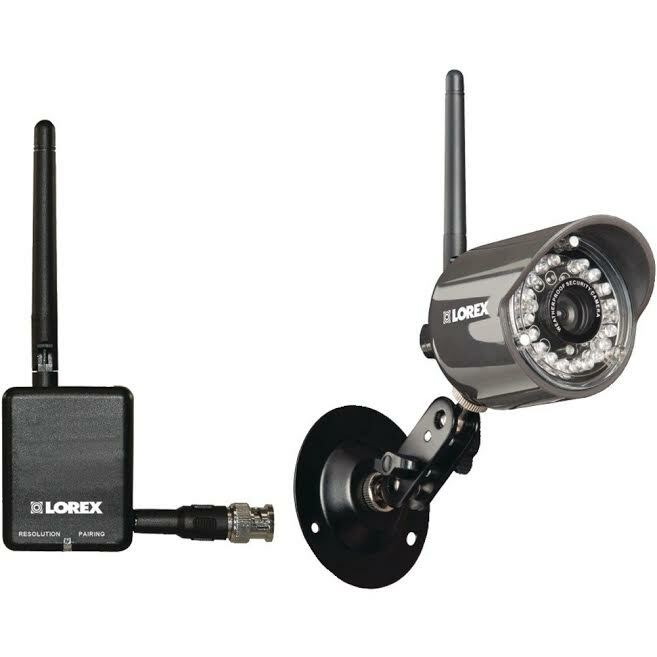 Therefore, Lorex LW2110 is only good if you only care about the simple wireless setup and don’t need remote access. Connection between the camera and receiver still drops occasionally even in a direct line of sight, no built-in remote access feature. Check the best price of Lorex LW2110 here!